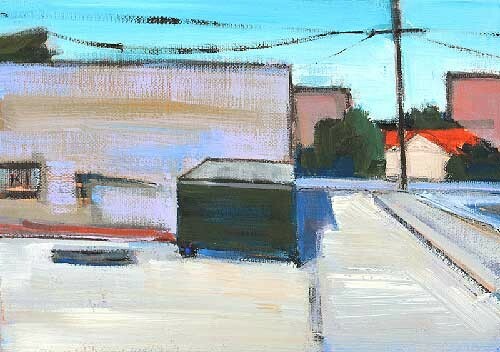 This entry was posted in Landscape Paintings, San Diego Paintings, Urban Landscapes and tagged $175, 5 x 7 inches, alley, dumpster, hillcrest, oil on linen on panel, san diego on July 24, 2015 by Kevin. 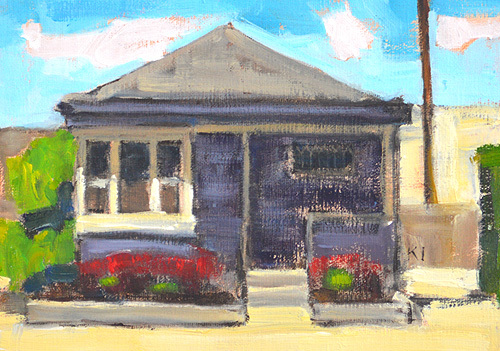 This entry was posted in Landscape Paintings, San Diego Paintings, Urban Landscapes and tagged $150, 5 x 7 inches, california, hillcrest, oil on linen on panel, plein air, purple house, san diego on July 22, 2015 by Kevin. 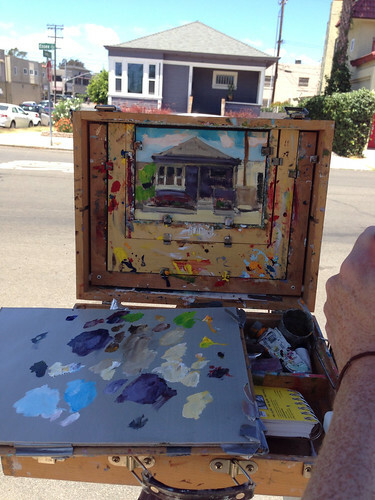 Painted last year in Hillcrest. 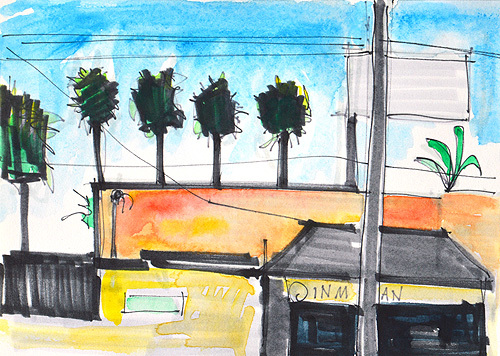 This entry was posted in Landscape Paintings, San Diego Paintings and tagged 5 x 7 inches, california, hillcrest, san diego, university ave, watercolor on July 6, 2015 by Kevin. He tossed the headphones on the table, then disappeared. I wondered why. 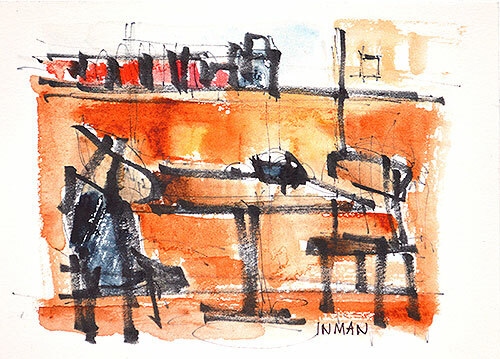 This entry was posted in San Diego Paintings and tagged 5 x 7 inches, hillcrest, interior, san diego, starbucks, watercolor on January 29, 2015 by Kevin. Pecs in Hillcrest/ North Park. 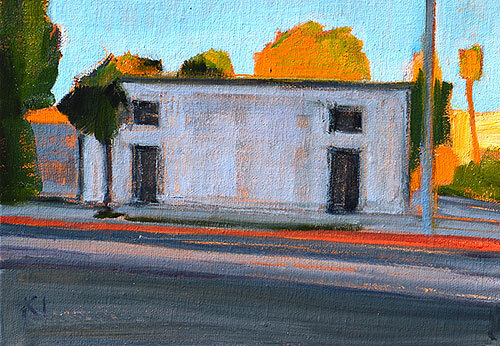 This entry was posted in Landscape Paintings, San Diego Paintings, Urban Landscapes and tagged 5 x 7 inches, california, gay bar, hillcrest, north park, oil on linen on panel, pecs, san diego on December 4, 2014 by Kevin. 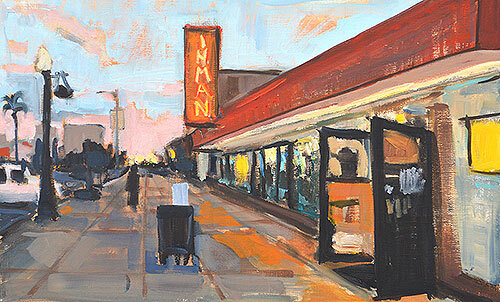 This entry was posted in Landscape Paintings, San Diego Paintings and tagged 8 x 13 inches, california, cityscape, dusk, hillcrest, landscape painting, liquor store, oil on linen on panel, san diego on November 17, 2014 by Kevin. 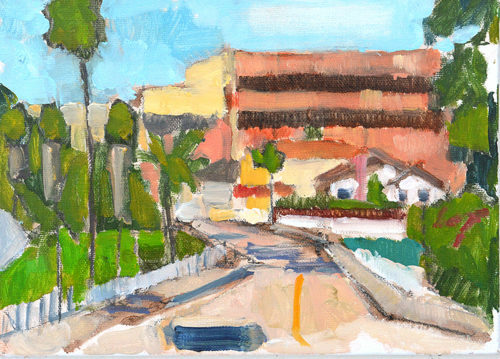 This entry was posted in Landscape Paintings, San Diego Paintings, Urban Landscapes and tagged 5 x 7 inches, city, hillcrest, palm tree, san diego, urban, watercolor on August 4, 2014 by Kevin. 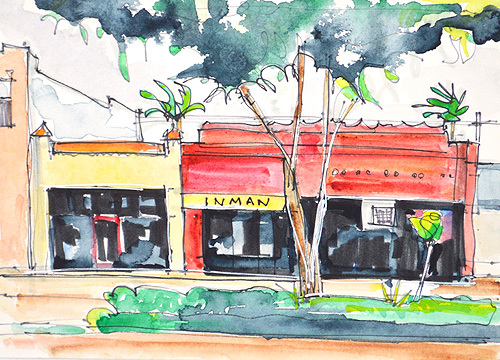 Painted this morning on University Ave in Hillcrest. for sale. 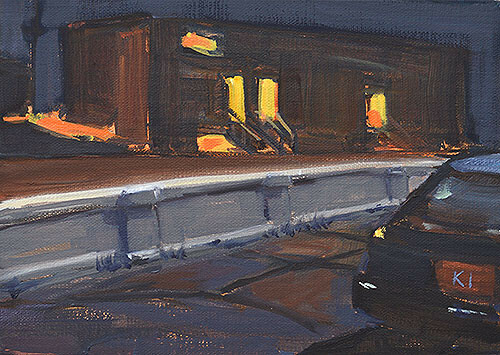 Watercolor’s been speaking to me lately, and oil less so. Normally I’m more of an oil person but I’ve been at this long enough to know there’s no sense in trying to force it. So watercolor it has been. Another day today with unseasonably overcast skies and a little rain. 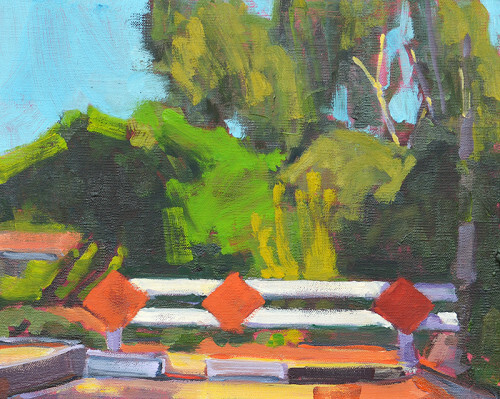 This entry was posted in Landscape Paintings, San Diego Paintings, Urban Landscapes and tagged 5 x 7 inches, city, hillcrest, landscape, san diego, urban, watercolor on August 3, 2014 by Kevin. 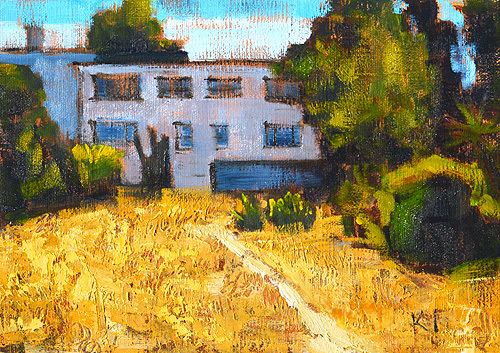 This entry was posted in Landscape Paintings, San Diego Paintings, Urban Landscapes and tagged 5 x 7 inches, california, craftsman, hillcrest, landscape painting, oil on linen on panel, san diego, urban on July 23, 2014 by Kevin. 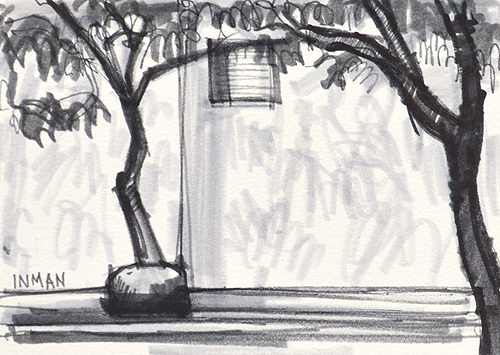 This entry was posted in Landscape Paintings, San Diego Paintings, Urban Landscapes and tagged 5 x 7 inches, hillcrest, jacaranda, marker on paper, mimosa, san diego, watercolor painting on July 13, 2014 by Kevin. 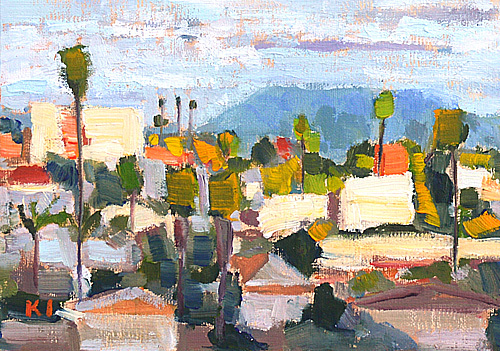 This entry was posted in Landscape Paintings, San Diego Paintings, Urban Landscapes and tagged 5 x 7 inches, california, hillcrest, landscape, north park, oil on linen on panel, painting, san diego, university heights on March 29, 2014 by Kevin.